Download a blank fillable Dd Form 2904 - Application For Voluntary Separation Incentive Pay Under Vsip Phase Ii in PDF format just by clicking the "DOWNLOAD PDF" button. Complete Dd Form 2904 - Application For Voluntary Separation Incentive Pay Under Vsip Phase Ii with your personal data - all interactive fields are highlighted in places where you should type, access drop-down lists or select multiple-choice options. AUTHORITY: 5 U.S.C. 9902(i), DoDD 1400.25, DoD 1400.25-M, Subchapter 1702, "Voluntary Separation Programs". DISCLOSURE: Voluntary; however, failure to provide required information may result in denial of the application for VSIP. position. 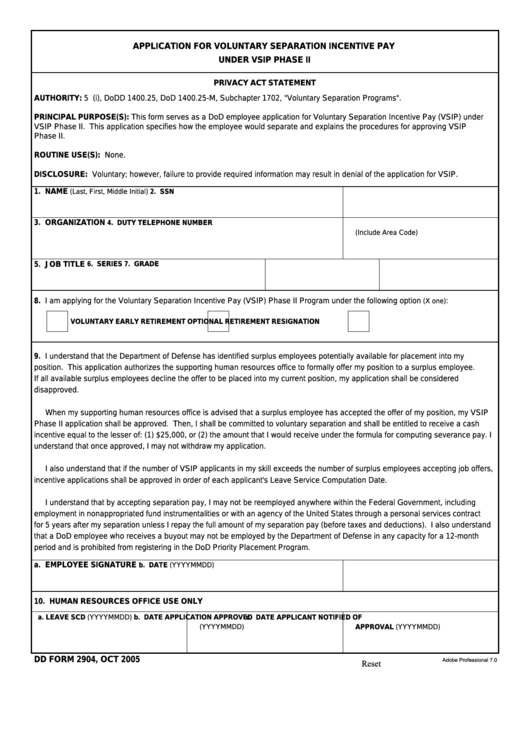 This application authorizes the supporting human resources office to formally offer my position to a surplus employee. understand that once approved, I may not withdraw my application. incentive applications shall be approved in order of each applicant's Leave Service Computation Date. period and is prohibited from registering in the DoD Priority Placement Program.